Fighting is as popular today as it ever has been. In contrast to our many songs about peace and love, when it comes to entertainment our time usually goes where there is a fight. Granted we have tidied it up a bit from the Romans with their gladiator battles in the Coliseum, but there is still plenty to watch. If you don’t care for the in-your-face fighting of UFC or pro wrestling you can always tune into one of the many reality tv shows for some “social” fighting. The social fighting may not have as much sweat or blood, but it can be just as nasty. Please don’t let that carry over into your marriage. Disagreements are bound to arise, but that doesn’t mean you have to end up as Ted and Peg Bundy. (Or any other number of sitcom couples for that matter.) Today’s post aims to help you handle your arguments quickly so your marriage doesn’t marinate in argument sauce. Here are four tips for better arguing. 1. Decide who’s right before you start – This can work wonders for your marriage. My wife and I have an agreement that applies to any disagreement we may have. It has already been decided that we will say I’m right and act as if she’s right. So basically I get to say I’m right while we take action based on her point of view. This works for us because she is smarter than I am. (Or is it because I like to be right?) You can negotiate your own agreement to fit your marriage. 3. Consider inflatable sumo suits – I’ve been dying to try this idea out. I suggest the procurement of two inflatable sumo suits. Once inflated, the suits allow the participants to waddle into each other trying to bump each other over. The last one standing is the winner. This could truly put the fun back in arguing. 4. Argue in cartoon voices – The next time you catch the two of you in an argument, simply call “Cartoon Time.” Both participants then have to switch to a cartoon voice. (You may want to practice a few to be ready.) It’s hard to believe that you could continue to argue more than ten minutes with Porky Pig or Yogi Bear. (“Hey Boo Boo, I totally disagree with you.”) You are also a lot less likely to argue in public if you have to use a cartoon voice. 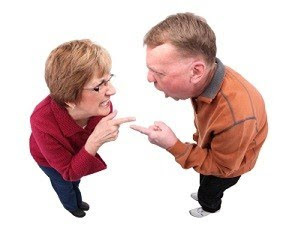 But seriously: Disagreements can tear a marriage apart quickly. It’s important to deal with disagreements and not let them carry on. It always comes back to our ability to communicate with each other. Do you have an unresolved dispute in your marriage that is silently putting distance between the two of you? What about you? Do you have any tips about handling arguments? Any funny argument stories? Share them in the comments!